Paris is always a good idea, but Paris during the holidays, well, that can be magical. I have spent several Thanksgivings, Christmases and New Years in Paris and always had a wonderful time. It is low season, so except for July and August when the Parisians escape for their holidays, you have the city to yourself. The holiday events such as markets, ice skating and shows will keep you busy above and beyond the “regular” things to do, and the seasonal foods and drinks will make for warm bellies and large smiles. Along with my own suggestions, I’ve asked a few other bloggers about their favorite things to do in Paris for the holidays. Winter time means seasonal foods showing up on restaurant menus. Don’t miss out on foie gras, truffles or game meat like deer, boar, pheasant. However, seafood is exceptionally good during this time of year with the most amazing oysters and scallops. Depending on how strong your sweet tooth is, you will also want a slice of bûche de noel, or yule log, made in all shapes and elaborate sizes. 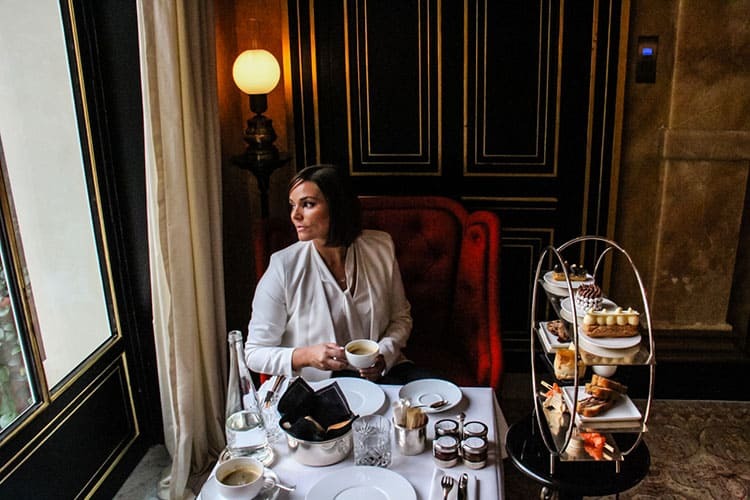 Step back in time to 19th Century Paris by taking tea at La Reserve Paris. The incredible 5-star La Reserve has just taken out the title of best hotel in Paris by Condé Nast Traveller and when you walk through the beautiful oversized ruby wrapped doors, in the Champs-Élysées arrondissement, you will see why. Every last detail has been carefully considered when it comes to the decor and the service. We settled into seats at the table by the window of the Grand Salon, looking out into the courtyard, thankful we took the time to dress for the occasion. We took in the atmosphere and each detail with every bite of the artful delights that were delivered to our table. Tea at La Reserve is such a special experience and the perfect way to indulge during the holidays; whether it is a family outing or a date during your stay in the City of Lights. What better way to spend the holidays with loved ones other than while indulging in chocolate? I’ll tell you. It’s by taste testing the freshly made, mouth-watering chocolate at the world’s best chocolatiers located in the heart of St. Germain, Paris! Just writing this makes my heart swell with love for authentic French chocolate. My wife and I are chocolate lovers and we search the globe for the best. Nowhere else comes close to what’s available in St. Germain all within a 20-minute walk. 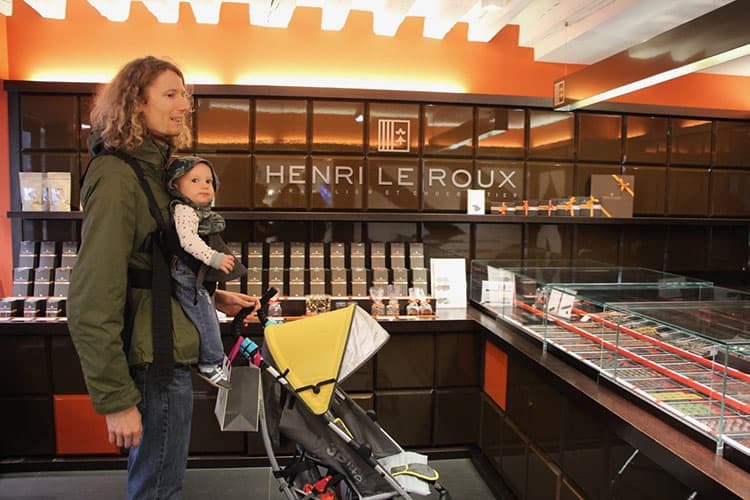 The four best chocolatiers in our experience are Patrick Roger, Henri Le Roux, Meert and Maison Georges (not in any particular order). We recommend buying a sampler box from each store and seeing which chocolates you like best. Then when you know, you can go back and stock up on personal supplies and if you’re not greedy you could get more as gifts for your loved ones back at home. If this (life-changing) experience doesn’t put a giant smile on your face and make your eyes close in awe I don’t know what else would. Having this experience during the holidays will be unforgettable, there’s no doubt. Indulge. Enjoy. Experience true love with the ones you love. When you’re in Paris during the holidays be sure to indulge in one of these delicious treats: vin chaud, chocolat chaud, marron chaud, or Galettes des Rois. Vin chaud is red wine that has been mixed with spices and is sometimes served with an orange slice and sugar on the side. There is nothing better than having a glass of this warm mulled wine at an outdoor cafe in Paris. Don’t worry. You won’t get cold as most cafés have heaters overhead in the awnings. If you really want to indulge consider having a cup of hot chocolate, especially from Angelina’s on Rue Rivoli. While you can “take out” a cup for just over 4 Euros, it’s much more fun getting a table inside and having their fabulously rich and famous “Le Chocolat Chaud l’Africain”. It’s made with three cocoas from Niger, Ghana and Côte d’Ivoire and served with a heaping bowl of whipped cream. After you’ve had your beverage, visit one of Paris’ outdoor markets. 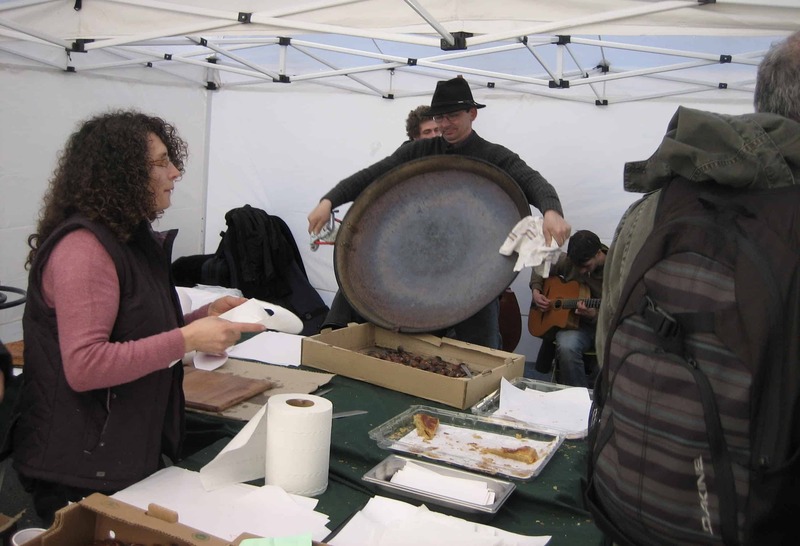 Often there are vendors there selling roasted chestnuts. Sometimes the local business association will provide free samples to celebrate the season. These sweet nuts are served in a paper cone and are perfect to take the chill out of the wintery day. Just watch your fingertips as you peel away the skins as these chestnuts are hot! Finally, every December and January you will see boulangeries selling a cake called a the “Galette des Rois” (“Cake of Kings”). There is a long tradition that on January 6, the day of Epiphany, the cake is shared and whoever finds the bean inside can be King or Queen for the day. It is a puff pastry that has an almond filling and you can buy a slice, a mini Galette, or a large one. The Elysée Palace makes a gigantic one each year and it is about 4 feet in diameter. Paris is always a beautiful city, but during the holiday season she puts on a grand show. Many buildings, monuments, department stores and boutiques are lit up in the evening, and of course, the Eiffel Tower puts on a display as well! Don’t forget our tripod for wonderful night photography! Here are some more classic suggestions. Contributed by Shoba George of Just Go Places. You can fill up on Christmas seasonal cheer at the Cathedral of Notre Dame. Once you get past the hordes of tourists congregated in the front of the church located on the Ile de Paris, you are enveloped in the 850-year-old Gothic architecture. As the headquarters of the Archdiocese of Paris, it is a fully-working church. Despite its historical, architectural and tourist value, when you visit the church, it is clear the church takes its religious role to heart. 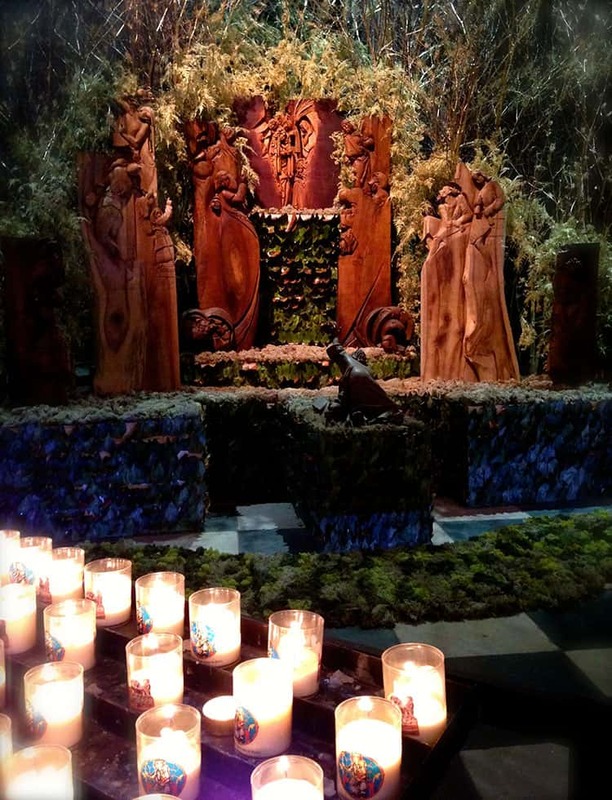 Every year, Notre Dame’s Christmas nativity scene is visited by approximately 2 million people. This Nativity is created anew each year. If you are in Paris for Christmas itself, visiting the Midnight Mass at Notre Dame is highly recommended. The ambiance is magical with the twinkling lights, ringing bells and soaring voices of the choir. Even if you are not Christian or a church-goer, you will find yourself moved by the sheer spectacle of the experience. Christmas in Paris is very festive and one of my favorite things to enjoy are the storefront decorations especially at the Galleries Lafayette. With amazing displays filled with wonderfully animated characters, the storefront is packed a solid 3 to 6 feet deep with people trying to get a peek at them. Inside the store, you can also see beautiful decorations and the impressive stained glass interior is lit up like a jewel box. If you have time, go to the rooftop deck to enjoy the fabulous views of Paris and even sunset with cocktails from the rooftop bar. It’s a great way to get into the Christmas spirit and while seeing all the festive decorations at this landmark department store. Paris is the “city of lights” on a normal day but when Christmas time is upon us, the city is aglow with festive lights and displays and it’s hard not to find your Christmas (or Holiday) spirit. The Champs-Elysees is lit up with festive lights stretching up and down the avenue, making it even more magical. If that wasn’t enough to get you in a festive mood, the roundabouts are decorated with holiday lights and the street is lined with market stalls with Christmas music that fills the air (ironically in English **tourist alert**). The largest collection of market stalls in the city of Paris awaits you. While I found a very small section of artisan craft vendors (the artist is selling his/her creations and usually at the stall to talk to about their work), for the most part, the stalls are selling items not made in France but lovely and affordable nonetheless. There are gifts for everyone on your list and within your budget. There are multiple food vendors with mulled wine, crepes, and TONS of Nutella – you won’t go hungry as you wander. Just like the Champs-Elysees, this market is meant to be strolled at a leisurely pace (well, that and the fact that there are many people walking and stopping in front of you). A small ice rink, a visit with Santa and a beer garden are also there to entertain you. With both sides of the Avenue filled with stalls, a visit will likely take about two hours or more. Filled with festive decor and unique shopping opportunities, the Champs Elysées Christmas Market is the perfect destination for a French holiday experience with the family. Thousands of visitors flock to the market each year to see the rows of quaint wooden chalets that make up the Christmas village stalls. Inside each one, independent craftspeople, farmers and vendors sell their wares and put on demonstrations of their craft to excited audiences. French farmers offer delicacies such as cheeses, wines and local cured meats to take home as Christmas gifts (or tuck into as a midnight snack after shopping!) Hand-carved wooden toys and Russian dolls add splashes of colour to the traditional toy stall, and delicate ornaments wait to be hung on Christmas trees. 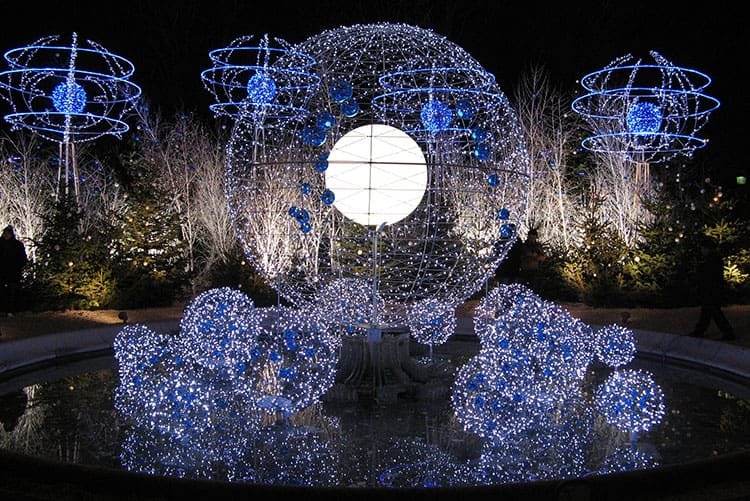 The decorations of the Champs Elysées Christmas Market are a spectacular site, with huge illuminated baubles, lit-up sculptures and oversized strings of fairy lights creating a magical festive atmosphere. Pick up a Vin Chaud and a hot chocolate crepe as you wander through the rows of stalls, shops and exhibits and select foil-wrapped chocolates and sugar-coated crystallised fruits for Christmas gifts. Pop all of your shopping in one of the hand-sewn Christmas stockings for an extra special gift for your loved ones. Please note there will be no market for the 2017 season. The boat gently eased into the water as we stood looking westwards at the sky which had turned into a shade which was neither crimson or orange. It was a shade that looked so bewitching and surreal, that it seemed to have emerged from beyond the colors of the spectrum. The sun was just setting and a strange calm pervaded the atmosphere as a cool breeze blew in from across the river Seine. The Eiffel Tower loomed with its majestic presence as the departing rays of the sun caressed it. The most romantic of our dreams seemed to have come true as we stood watching the grand spectacle hand in hand while the boat set course for an enchanting night cruise of the Seine. “We are in Paris!” our hearts seemed to shout in unison as we looked at each other and smiled. The moment rendered words redundant. Slowly, the sun dimmed and day transitioned into the night. The lights of the City of Lights came on and the dark night was transformed into a glittering spectacle. The city seemed like a resplendent array of sparkling stars as we cruised the Seine. We passed the famous Notre Dame which was bathed in an ethereal glow of light and seemed to be enveloped in a strange and mystical halo. As we looked behind, the Eiffel Tower grabbed our attention as it stood in resplendent elegance, glittering in the night sky with the brightness of a billion diamonds strewn together. The boat gently weaved its way below the gaily decorated and brightly lit bridges that span the river Seine. The architectural finesse and beauty of the buildings on both sides of the river were accentuated by Christmas lights which glowed with a brilliance that warmed the hearts. We were totally swept away by the beautiful and enthralling spectacle that totally swamped our visual senses leaving deep impressions that we would carry home and treasure for a long, long time. One of the BEST and FREE things to do in Paris during the holidays is to visit the carousels that pop up around the city during the month of December. They come just in time for your holiday cheer, although some have been around for over 100 years. The city of Paris is awesome to provide free rides to those who want to be whirled far away from your everyday life! Maybe you are looking for something to do with your little one? You can occupy their time (and yours) by enjoying a Sunday afternoon in the park of Champ de Mars, – a green park right across from the Eiffel Tower. 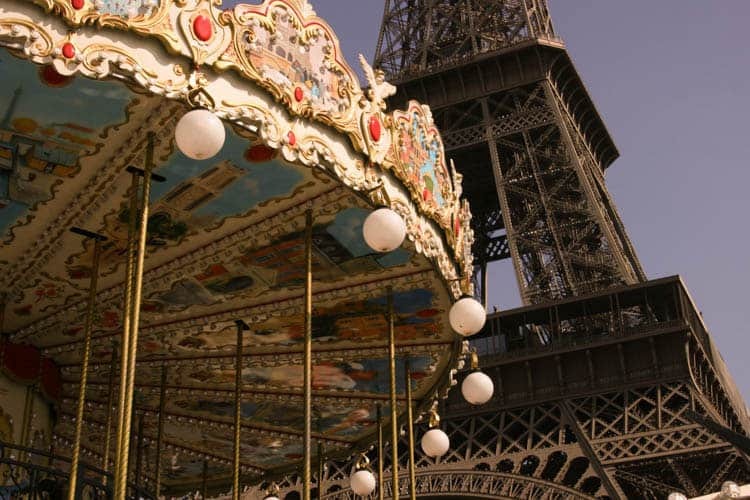 Not only will your sweetie get whirled and spun around, you can also enjoy views of the famous Parisian Icon – the Eiffel Tower. As the Parisian’s stroll the park with their doggies and kiddos, you can enjoy the magical moments with your kids by photographing them going up and down on horses that lunge forward, with their hooves raised and their eyes bright. Parisians have been taking photos and enjoying their kids there for years. One of the best-kept secrets in Paris is Montparnasse Tower, which is a perfect spot to add to your Parisian holiday trip! Though some savvy tourists discover the secret, it is not as well-known as some of the other famous Parisian landmarks, and therefore not as chock full of people when you try to visit. What most visitors to Paris don’t think about is that if they want to get that classic Paris shot (which includes the Eiffel Tower, of course!) they have to find a spot to view the entire city. 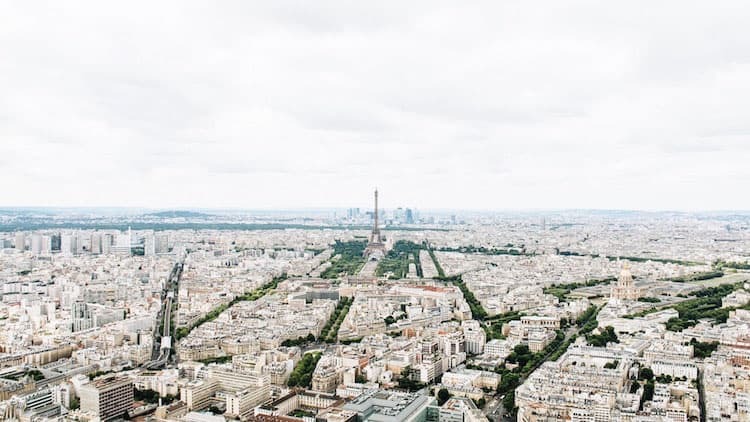 Most tourists choose to stick to a visit to the Eiffel Tower instead, which is an incredible place to view the city of Paris as a whole, but it is always packed and cannot offer the same iconic views as Montparnasse Tower! The tower offers a panoramic 360-degree observation deck with incredible views of Paris and the Eiffel Tower that shouldn’t be missed. 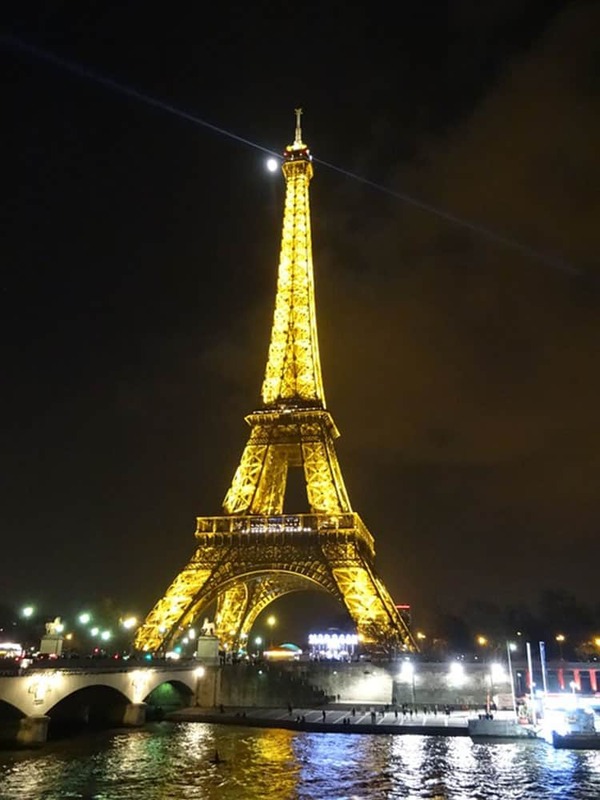 Before I visited Montparnasse Tower, I purchased my ticket online so that I wouldn’t have to wait – and let me tell you, that was perhaps the best decision I made on that trip! Being able to breeze right into the lobby and not have to wait in line with everyone else was a huge time-saver. Tickets are currently priced at 15€, or a little less than $18 USD. In my opinion, it is totally worth the money! I will be heading back to Paris for the third time after the holidays, and I plan to go back to Montparnasse Tower again. The tower is open for visitors 7 days a week, 365 days a year, from 9:30AM to 10:30PM during the winter months, giving you plenty of time to visit, day or night! I highly recommend adding Montparnasse Tower to your holiday plans in Paris – you won’t regret it! Nobody would associate graveyards with a romantic walk, right? Except maybe at Père Lachaise Cemetery. Especially during the holiday season, it’s totally worth it to take a break from the hustle and bustle of Paris and wander around the gigantic park in a time when the leaves are brown and yellow. 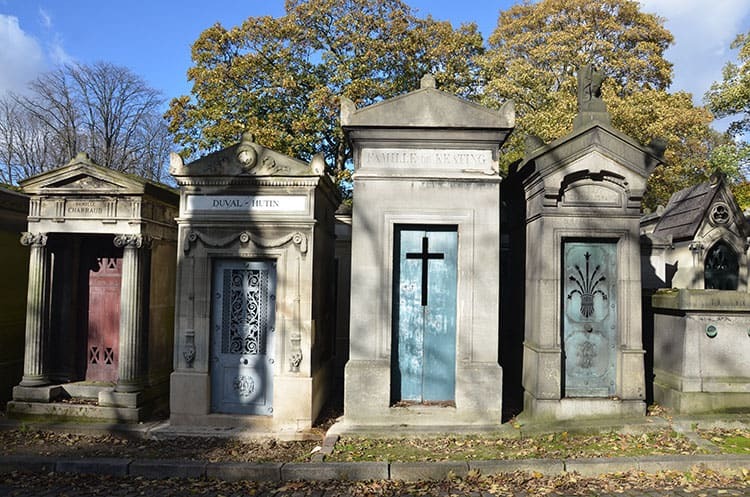 The cemetery, named after François d’Aix de Lachaise, is tucked away in the northeast of Paris, more precisely in the 20th arrondissement. Opened in 1804, Père Lachaise, which is also named the “city of the dead,” hosts over 300,000 tombs – and an incredible potpourri of celebrities across history making it the most visited cemetery in the world. From great poets and writers like Oscar Wilde, Molière, Balzac, Colette or Marcel Proust, to famous actors like Marcel Marceau, Sarah Bernhardt and Yves Montand, to composers, musicians and singers like Chopin, Edith Piaf and James Douglas Morrison, better known as Jim Morrison, former singer and frontman of rock band The Doors. That way, you can simply take a walk in the park and pass the graves of famous people. The best to do so is on a sunny day or shortly after a rain shower. With pleasantly light air, which smells of damp earth and with the scent of bygone centuries. When it is cold and dreary outside (hey, it is the winter after all!) there is still plenty to do in Paris. Namely, visit one of the many outstanding museums. These institutions are world class and you will have a difficult time deciding which ones to visit! 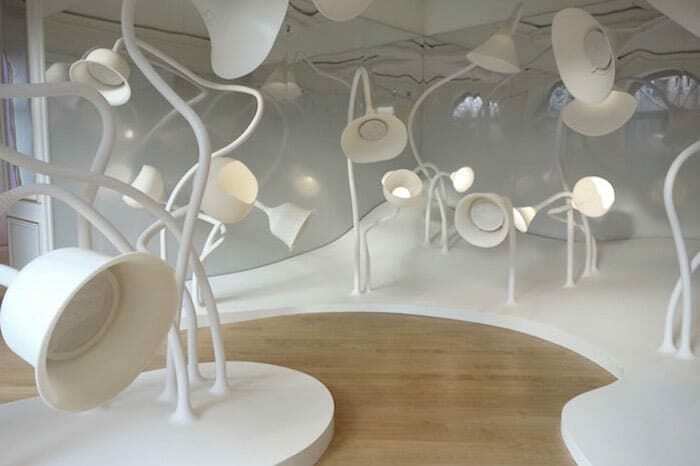 There is nothing like the scent of the Holidays and no better place to dive into all things fragrant than at the new Le Grand Musée du Parfum at 73 rue du Faubourg St Honoré in Paris. It’s especially festive if you combine it with a bit of high-end shopping on this famous street lined with designer shops and chic cafes. Located in the sophisticated 8th arrondissement, the 15,000 square-foot perfume museum has an elegant past of its own. At one time, the building was the residence of the Roederer champagne family and later was transformed into the Couture House of Christian Lacroix. The museum has three levels. The lower one is filled with the salacious history of perfume (you’d be surprised at what dark dealings have gone on in the name of ‘scent’). 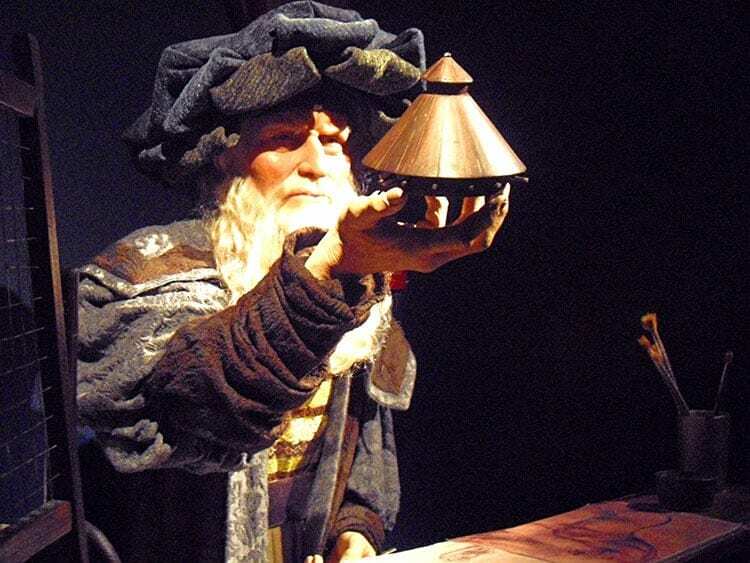 As well, the museum offers interactive displays and a section devoted to Lez Nez (the perfumer). My personal favourite is the futuristic Garden of Scents, where statuesque white metal flowers give off subtle bursts of fragrance both expected and unexpected, from light-as-rain florals and sweet cinnamon to fire smoke and Coca-Cola. You can end your visit with a trip to the concept shop to take home a fragrant souvenir. Christmas is such a magical and romantic time of year, and what better place to enjoy magic and romance than the Musée des Arts Forains. A perfect place to escape the bitter cold for a few hours where you can experience the glorious carnivals of yesteryear. Located in the Bercy pavilions, the old warehouses host old carousels, midway games, bicycle rides, and amusements from a by-gone era. What’s so wonderful about it is that you get to play the games, ride the rides, and immerse yourself in the past. The colors are all deep red and gold, and the artistry is ornate and whimsical. It feels like Christmas should feel, surprising and fun. Afterwards, enjoy some Christmas shopping, hot spiced wine, and delectable holiday treats at the nearby Bercy Village Christmas Market. 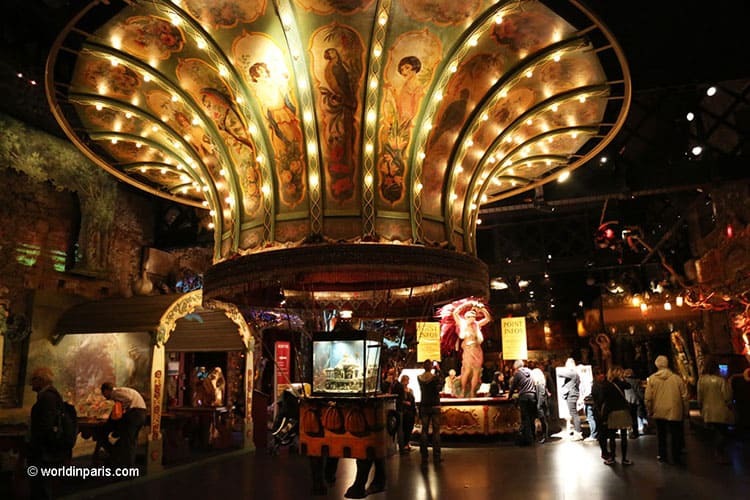 Le Musée des Arts Forains is a great museum to visit during Christmas Time in Paris. This is a museum dedicated to the world of funfairs with great ancient fairground artifacts, funfair games & shows, and other curiosities. Le Musée des Arts Forains is not a museum only for kids, actually, I would say that adults enjoy it even more than the little ones. This is because the fairground artifacts are unique and beautiful and the museum has a special atmosphere that takes people back to a forgotten (sometimes lost) past where things looked just more magical (at least through the eyes of a child). Don’t expect a museum where all the objects are displayed in glass cabinets or behind a security cord. This museum wants visitors to interact with all the artifacts: you can touch them, play with them and take as many rides as you want! 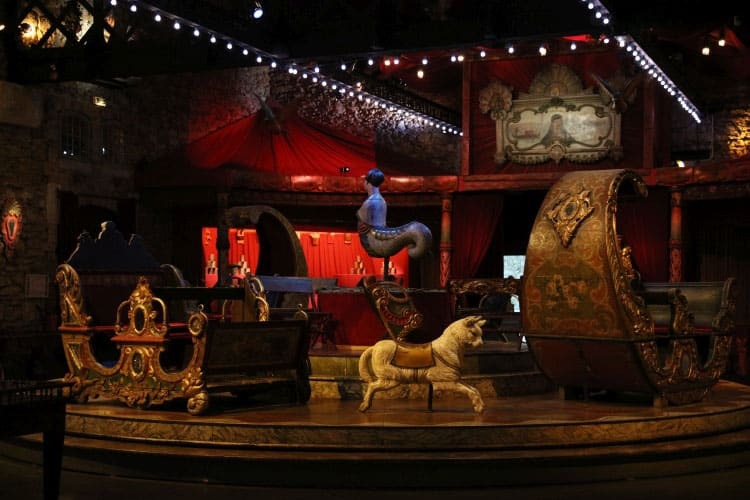 Le Musée des Arts Forains has also a very innovative scenography, were sound and lighting play a special role. Not many people know about this fantastic museum. This is because Le Musée des Arts Forains is usually open only for private events. Some exceptions include the events “Le Festival du Merveilleux” (during Christmas Time, from 26th December to 7th January) and “Les Journées Européennes du Patrimoine” (usually the third weekend of September). I’ve visited Grevin wax museum for the first time with my school when I was a kid. I don’t remember the time of the year. Maybe it was around Christmas or it was because of the magical extravaganza of the place, but the museum has always had a Christmas foretaste for me. It is therefore quite naturally that after admiring Paris from the top of the Ferris wheel on the Place de la Concorde, I took my little nephew to marvel at the Musée Grévin. After climbing the magnificent marble staircase, we arrive in the Palace of Mirages, a technological marvel imagined for the 1900 Universal Exhibition. Thanks to its play of lights and mirrors, the room looks huge. Then begins one of the most beautiful sounds and lights of the world which takes us to a Hindu temple in the midst of elephants then propels us in the middle of a frightening jungle before dazzling us with the palace of a thousand and one nights. Then we go to the discovery of the museum’s different worlds. Charles particularly liked to pose with the stars in the big theatre, such as Bruce Willis or Jackie Chang. But above all, he liked being able to dress as a king and pose with Charles IX and Charlemagne. Every year statues are added and new attractions created, such as the famous The Voice show, renewing interest in this Christmas visit. 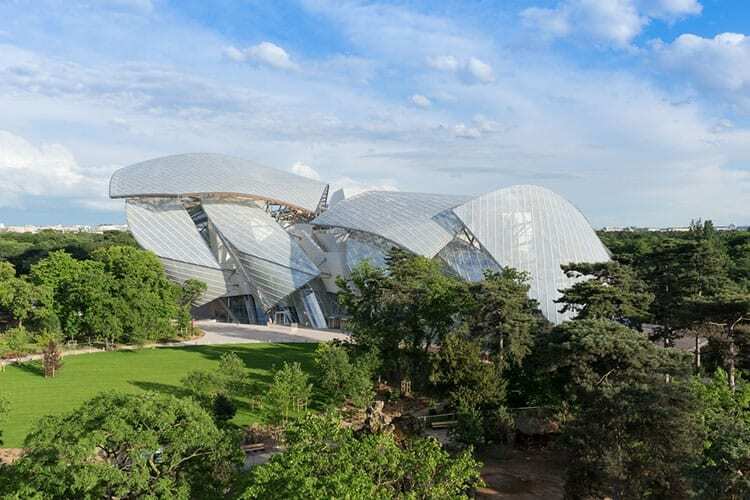 Foundation Louis Vuitton is definitely a must see monument if you are visiting Paris, especially during the holidays when it might get a little cold. It’s full of interesting exhibitions that make it a unique monument in the vast French cultural environment. Its a delicate mix of art, culture, and heritage which can be seen just in its architecture designed by Frank Gehry. It’s rooted in the history of artistic movements of the 20th and 21st century and its mission is to promote the dialogue between the artists, intellectuals and the public in order to accelerate the exchange of ideas that will make the Parisian cultural life grow. The building itself is magnificent and beautifully designed, it looks like a realization of a farfetched dream. The building easily fits into the surrounding natural environment, while at the same time plays with light and mirror effects that will keep you awestruck. Thank you to all my contributors, now it’s your turn! 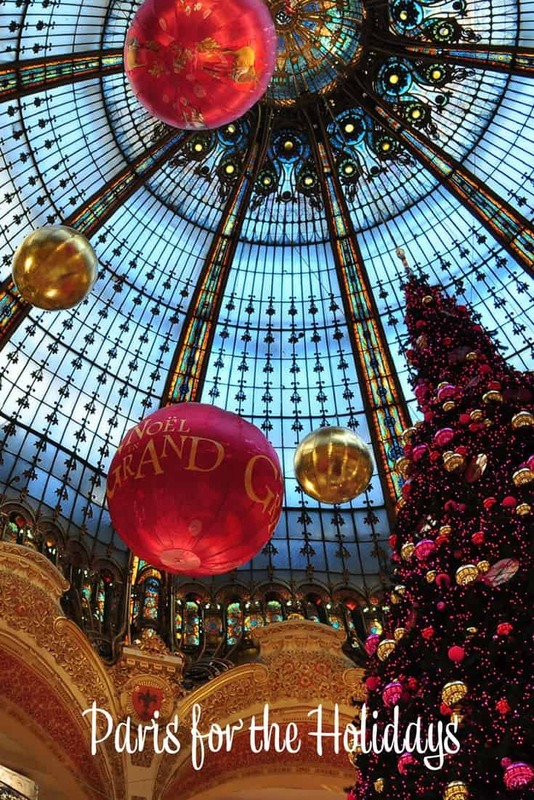 Have you been to Paris for the holidays, do you have a suggestion to add? You are so right: Paris is magical in December. We’ve celebrated several New Year’s there. @Monique, isn’t it amazing ? @Kelly, thank you, that is so sweet! Paris at Christmas sounds absolutely amazing. One of these days I’ll splurge and go enjoy that adventure. @Jodi, it is worth it, trust me! Count me in Andi! On y va! Paris is great for the holidays but if I may add- if you are in Paris for long enough to take a side trip to Strasbourg, France. 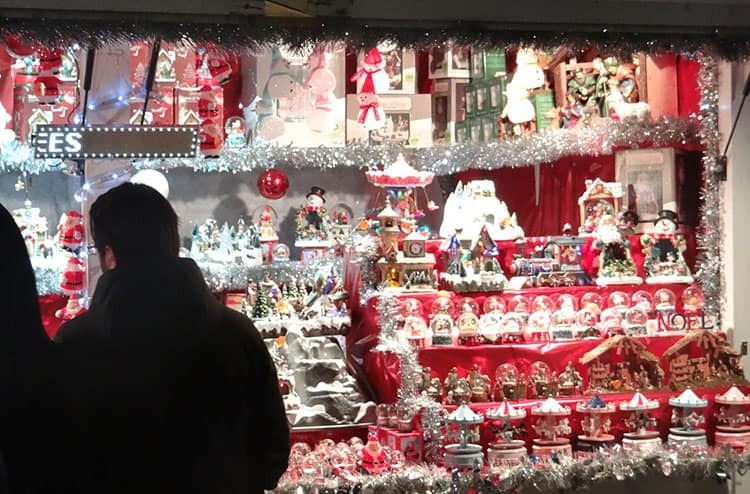 The best Christmas markets I’ve ever seen and its a Christmas village out of a fairy-tale! I have such great memories of there. @Danee, I completely agree with you! When in France on the backside of Geneva it was a short drive to Strasbourg and I was lucky enough to visit there twice, once during Christmas and once in the spring – it is a definite foodie place! I would so do it! Can’t be any colder than Iowa, heck, it may be quite warmer! Wow, Paris looks absolutely GORGEOUS for the holidays and in general. Going to Paris is definitely on my bucket list. I have lived in Paris for a few years but discovered a few places with your article! 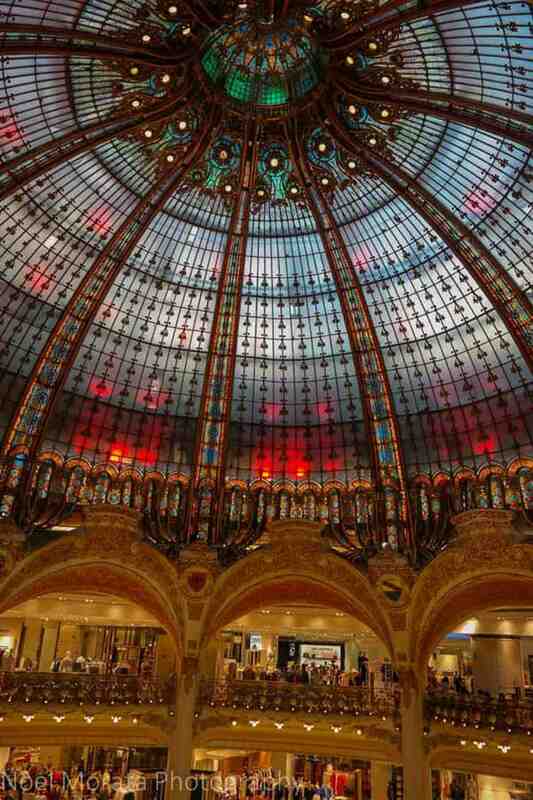 Each time I’m in Paris for Christmas, I can’t miss Galeries Lafayette. This is Christmas in Paris. Paris is high on my travel bucket list, but I never considered visiting during the holiday season. I am sure such a magical time of year only heightens the experience! I would LOVE to do something like this. What a great time. I bet Paris is gorgeous during the holidays. I would love to visit Paris during the holidays, I would love to visit all sorts of different countries during the holidays. Such beautiful pictures. Paris looks amazing to visit during Christmas time! I love visiting new cities during the holidays! I’ve been to Paris, and I thought it was amazing. I’ve never considered visiting for the holidays though. Now I really want to.